Using the System information plugin, check the version of PHP running on your server. If the version of PHP you are running is lower than 5.x, the plugin will not work. The way that WordPress deals with errors that are sent back during the registration process doesn’t work with earlier versions of PHP (4.4.9 for example). I opened a ticket in the WordPress bug database to ask for a correction. You can vote for that ticket (number #10672) to rise the issue with the WordPress team. 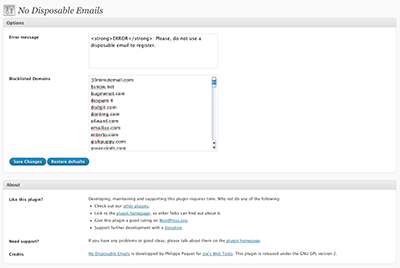 I installed this plugin coz a lot fake email getting in…. but there is no widget… where to set it? is it automatically delete the fake email? There is no widget with this plugin. You just have to activate it. When someone try to register using an email address from a domain that is on the black list, they get an error message. Wow, what a great plugin. You’ve saved us so much work. Can we send you a donation? Thank you very much. A donation will be very much appreciated. To make that easy, I just added a donation button in the sidebar. Hey, perfect. We’ll donate immediately. 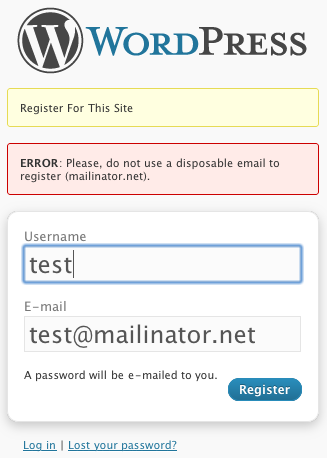 One thing you might want to do is update the .dat file on your side and add mailinator.com. We always get people coming in from there. Thank you very much for your donation. Much appreciated. I updated the .dat file with the additional four domains you suggested (version 1.0.2). Good work! I updated the .dat file along the way as well, and will let you know when we find more fake mail sites. No doubt, these are not the last ones. This plugin don’t work ! The plugin has been working fine for myself and a lot of users so I’m very surprised. I will contact you directly by email to find out what the problem is. I would like to respectfully request inclusion into your disposable email site list? ROTFL. I think you’re a bit confused but, yes, it will be my pleasure to add your site to the blacklist. For obscure reason, your plugin doesn’t do its job at all on my blog. The plugin is however activated and i’m using WordPress 2.8.2. So i don’t understand what’s going on. Please i need assistance. You can test yourself by clicking my site. 2 other users are having the same problem. I haven’t been able to reproduce it so far but with their help I have been able to narrow it down. Try the new 2.4 version and let me know. hello, i’ve tried to use your plugin but the thing is… it stops all the registrations and above all it gives some php errors. can you please help me out with this? sorry, i done something wrong, it seems that all that was needed was to chmod the no-disposable-mail directory 777. but if that’s needed all times isn’t it a security risk? to have directories with writing permissions for everybody? I’m getting an error. I looked at it and was confused. The latter two seem to be related to the first one. A couple of users are experiencing some seriously weird problems with the plugin. As I haven’t been able to reproduce those problems on my test server, I added a log file to the plugin to be able to provide better support. So, from version 2.4.1, the plugin needs to be able to write to it’s directory. I realize that may not have been the best move so I will either make that an option or move the log to the database in the next release. You are experiencing the same problem as Unreleased Psytrance. Making the plugin directory writable should solve that problem until the next release. Great plugin! I have been getting quite a few fake registrations recently and I am hoping this will stop them from happening. any plans on getting the plugin to work under WP 2.8.6 ? I would like only allow to register e-mail @dominio.com.br? I have a request or something for the wishlist? How about adding a report or sats feature so we can see how well the plugin is working? so far so good, we still get spam mail, but we just add the addys to the blacklist. Is there a way to change the setting to only allow email addresses that end in .edu only? That would be a very useful addition to this already awesome plugin.